Let’s just ignore the fact the my previous post says week 25…. Summer seems to have got a second wind in the first week of Autumn. I have more strawberries, more zucchini and a couple of new flowers on my pumpkins. Crazy. There was deluge of rain in the last week of February and then this week has been hot. Ideal growing conditions really. Kilos and kilos of tomatoes are coming off my plants. I feel like they will never stop! This weekend I am going to try to make yellow tomato soup from the mini pear tomatoes. 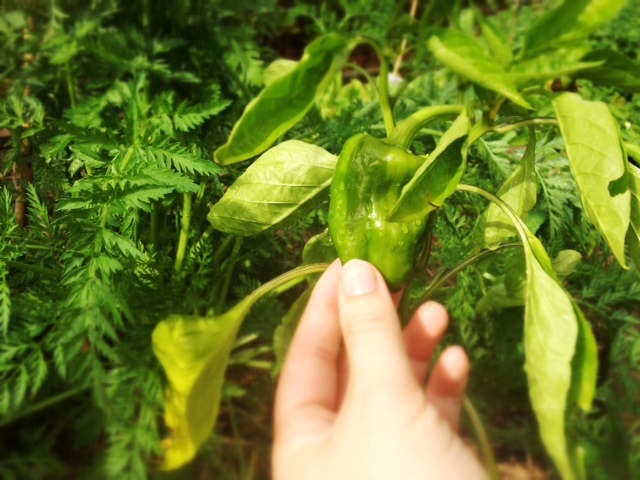 There is an actual capsicum growing on my capsicum plant!! 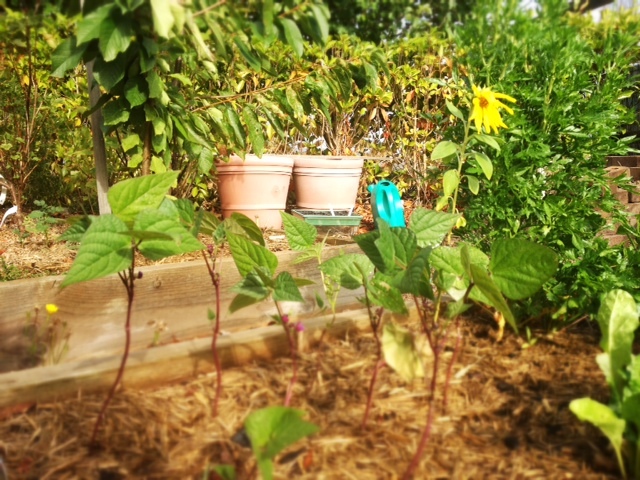 There is a really sweet little sunflower wedged in between my parsley and dwarf purple beans. The funny thing is I thought I bought regular size sunflower seeds. 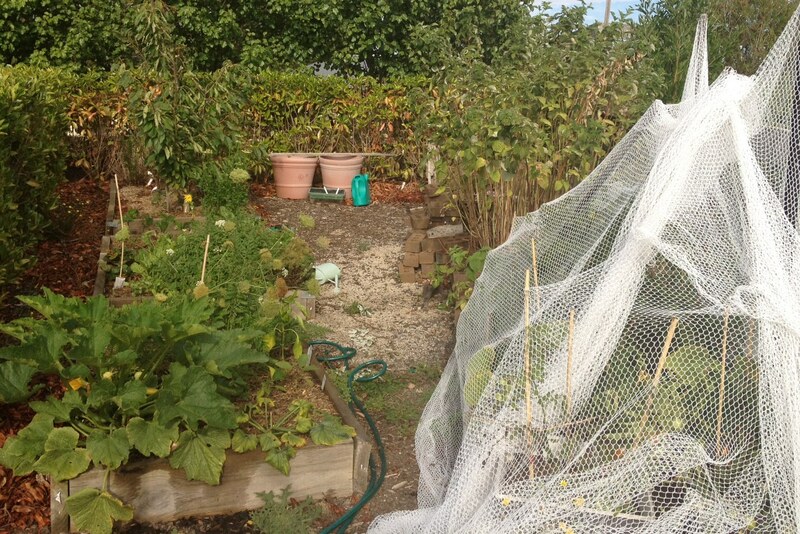 Everything seems to grow mini in my garden…. 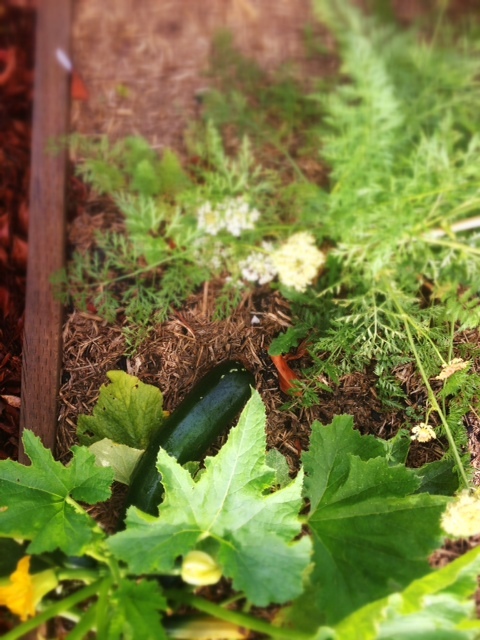 One thing that isn’t mini is a sneaky monster zucchini that I found this morning. Yesterday is was tiny and I thought it had another couple of days to go before I would pick it to use in my veggie twister, but now it’s far too big! Stuffed zucchini for dinner it is, then. Still no basil popping up. I guess I should now give up on that. There is a little corriander plant and maybe a celery. The rocket is going nicely. It isn’t wild rocket, though, which is my favourite. This seems to be some other kind that doesn’t have this spindly leaves that my other plants had. This looks a little bit more like butter lettuce. Whatever, it’s growing, right?! Some really typical Spring weather this week- rain sun rain sun. Great for the garden. My to-do list got two jobs knocked off it. I filled up the new garden bed with soil I dug over in the compost pile. I approached that job with trepidation. Last weekend I was at a friend’s house doing a massive working-bee in their yard. At some point someone lifted the cover off their compost heap and discovered a whole nest of baby mice. It was quickly covered up and left for another day. With that in mind, I dug into my pile. I half expected to hear a squeak or two, or find am impaled mouse on my pitch fork (which would have been followed by dancing a crazy pitch fork jig trying to dislodge it, screaming and then probably a little vomit into the bushes). Luckily there was non of that. The whole thing was a bit of a let-down, really. I expected to find, beneath the crust of dried grass clippings, a lush earthy matter writhing with worms and promise of making my vegetables grow into some kind of super-veg that would win prizes at country fairs. I found dirt. Some of it was obviously some clumpy clay diggings dumped there by the previous owners from another part of the garden. Most of it was just dry, lumpy dirt that was not particularly dark or lush. I saw a couple of worms. Anyway, I decided maybe my ideals of what good compost looks like were just a bit out of whack so I shovelled three barrow loads into my garden bed (compost heap now empty), added a bag of cow poo and dug it over. Meh. I guess it feels good to know that one part of my garden was put to use in another part. I was going to just get some dirt delivered from the nursery. This has got to be better, right? 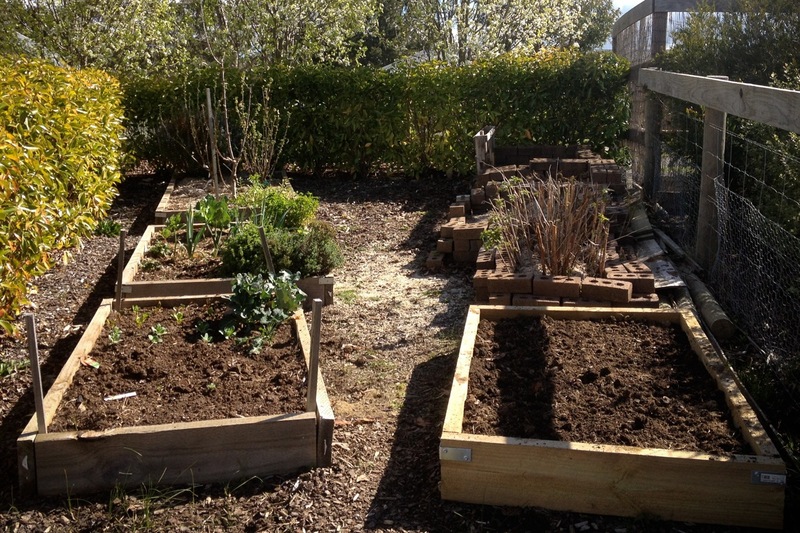 I’ll be crossing off a couple of things on the to-do list, but I’ll be adding a new one: learn about how to do awesome compost. 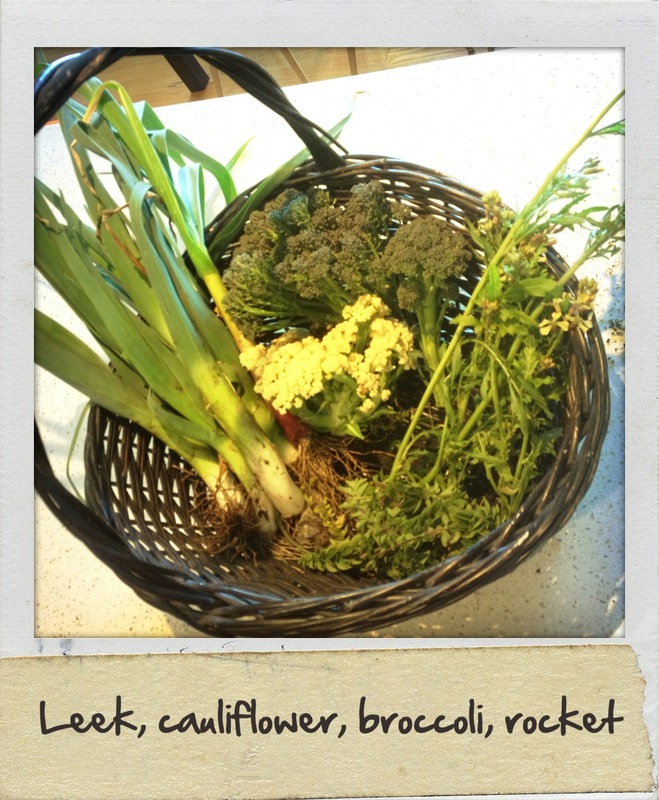 Picked some more leeks, rocket, cauliflower and some broccoli. My friends can expect little broccoli and leek bundles on their doorsteps. I am getting a bit over-run by the stuff. It is the first time I have picked broccoli from my garden, but every week we get a Luckwood Organics box and I cannot keep up with the broccoli that has been in the last few boxes. On the upside, my kids have completely given up whingeing about broccoli since it is on their plates pretty much every night.